The Giants have acquired Evan Longoria from the Rays in exchange for major leaguer Denard Span, plus prospects Christian Arroyo, Matt Krook, and Stephen Woods. Below are the KATOH projections for the prospects received by Tampa Bay. WAR figures account for each player’s first six major-league seasons. KATOH denotes the stats-only version of the projection system, while KATOH+ denotes the methodology that includes a player’s prospect rankings. In total, my KATOH system projects these prospects for a combined 2.4 WAR (2.2 by KATOH+) over their first six years in the majors. Arroyo missed a large chunk of 2017 due to multiple hand injuries and hit just .192/.244/.304 in 34 games with the Giants. Even without accounting for his small-sample big-league struggles, though, Arroyo’s track record doesn’t portend particularly great things. He hit a punchless .274/.316/.373 at Double-A in 2016 and his small-sample success at Triple-A last year was largely aided by his .427 BABIP. Arroyo’s youth and contact skills make him interesting, but he has very little power or speed and has already more or less moved off of shortstop. 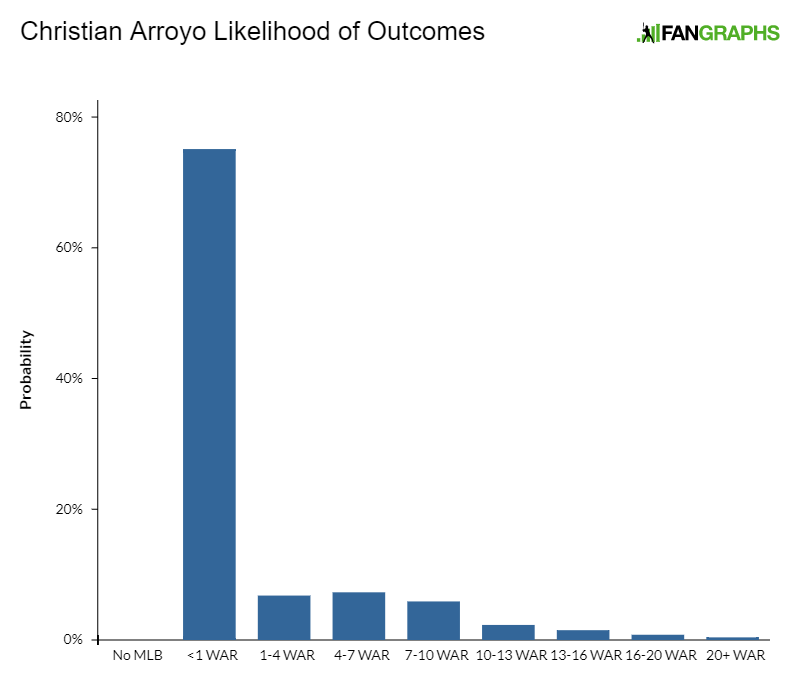 KATOH’s opinion on Arroyo strongly disagrees with the scouting consensus. He was the consensus No. 107 prospect last offseason, with Eric Longenhagen giving him a 55 FV. To put some faces to Arroyo’s statistical profile, I calculated a Mahalanobis distance between Arroyo’s 2016 and 2017 performance and every Double-A and Triple-A season since 1991. In the table below, you’ll find the 10 most similar seasons, ranked from most to least similar. The WAR totals refer to each player’s first six seasons in the major leagues. Woods pitched to a 2.95 ERA as a starter last year but did so as a 22-year-old in Low-A. 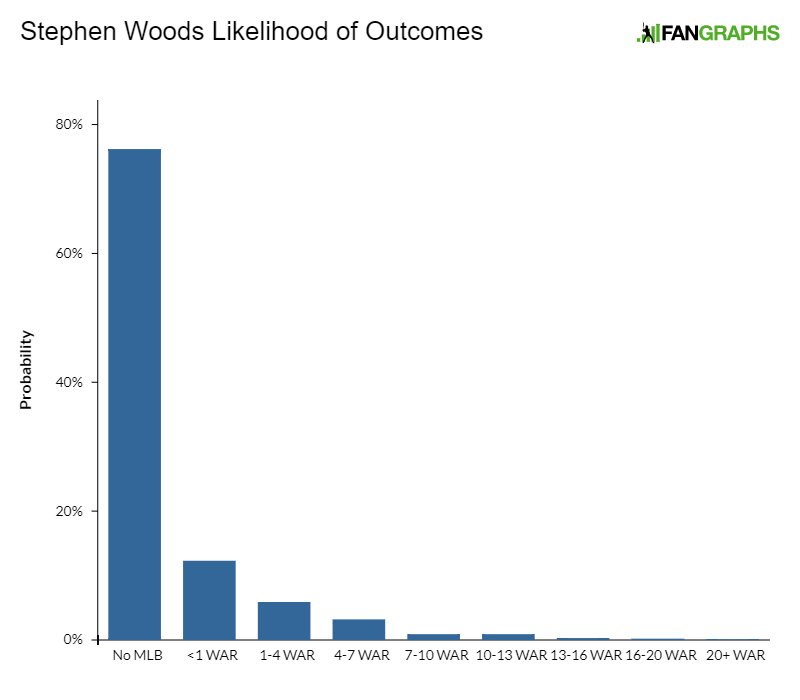 Woods also walked a concerning 13% of opposing batters, which suggests luck played a role in his shiny ERA. Woods’ numbers have been fine but aren’t terribly impressive coming from a college draftee in Low-A. His most noteworthy Mahalanobis comp is Cole Kimball. Krook has good stuff but hasn’t had much luck using it to get batters out. Command issues have yielded walk rates well into the double-digits, including a 16% clip last year. 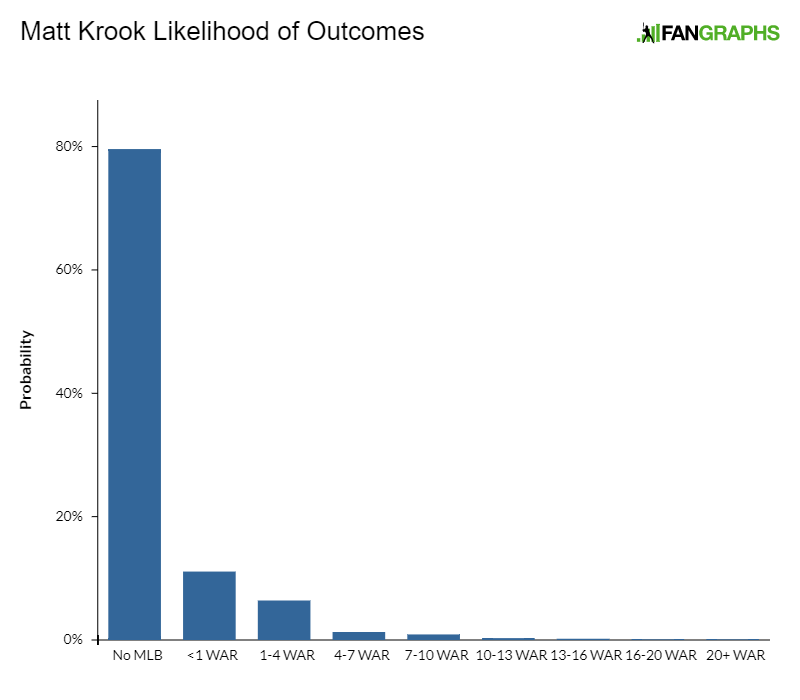 Krook is a 6-foot-4 lefty who strikes guys out, which gives him a glimmer of hope, but 22-year-olds with crappy numbers in A-ball are a dime a dozen. His most noteworthy Mahalanobis comp is Jean Machi. We hoped you liked reading Projecting the Prospects in the Evan Longoria Trade by Chris Mitchell! KATOH had some of the Rule 5 guys with 3-5 WAR forecasts for their first 6 years. 1.8 seems really low for a former Top-60 prospect like Arroyo. Guess he’s gotten worse since those days.